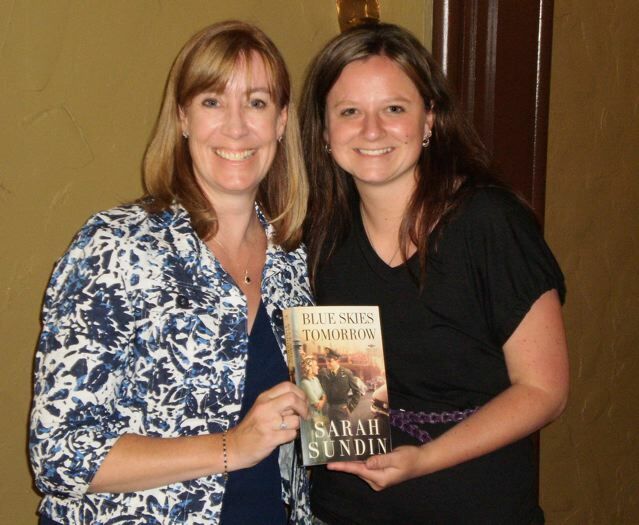 Sarah Sundin is a masterful storyteller and is one of my must-read authors. 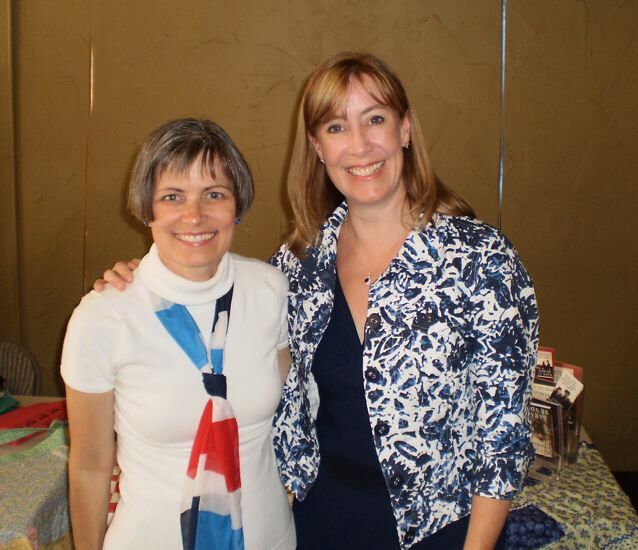 When I received Sarah’s newsletter with an invitation to her book launch party, I got excited. Normally I read such announcements and bemoan the fact that I live too far away. However, a two-hour drive is all that separates Sarah and me, so I sent my RSVP ASAP. 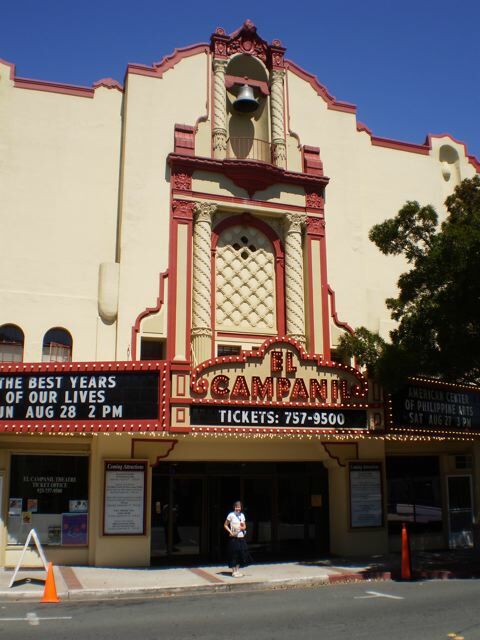 At 1 p.m. Sunday, August 28, my husband and I arrived at the El Campanil Theatre in the riverfront town of Antioch, California. The heroes in Sarah’s three WWII romances live in Antioch, and portions of the stories take place in the town. In the third book, Blue Skies Tomorrow, the eldest Novak brother takes his gal to see a show in this historic theater, which is on the book’s cover, so it made a fitting location for Sarah’s launch party. Sarah worked with the theater management to select a period movie and chose the 1946 film, The Best Years of Our Lives, which shows the adjustments made by three servicemen upon returning from WWII. 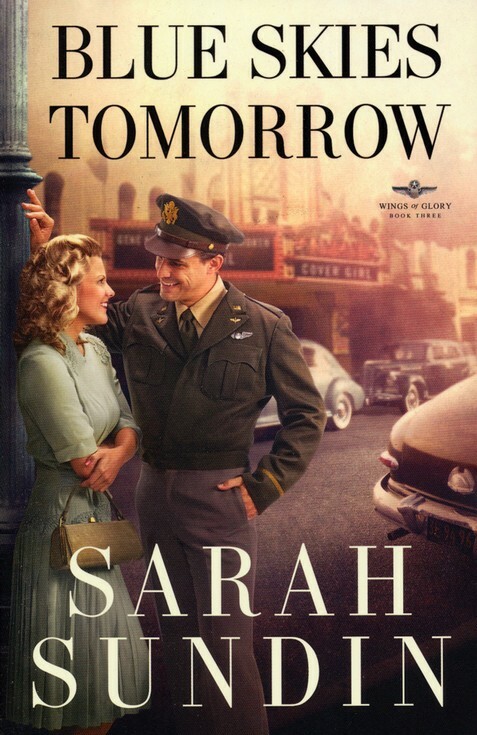 The final book in Sarah’s Wings of Glory series, Blue Skies Tomorrow, ends with the conclusion of the War, so this movie was a great choice. A couple in WWII uniforms greeted the guests. Marci Seither is a writer friend of Sarah’s who made the cute 1940s-era aprons Sarah is using as drawing prizes. (Nope. I didn’t win one.) 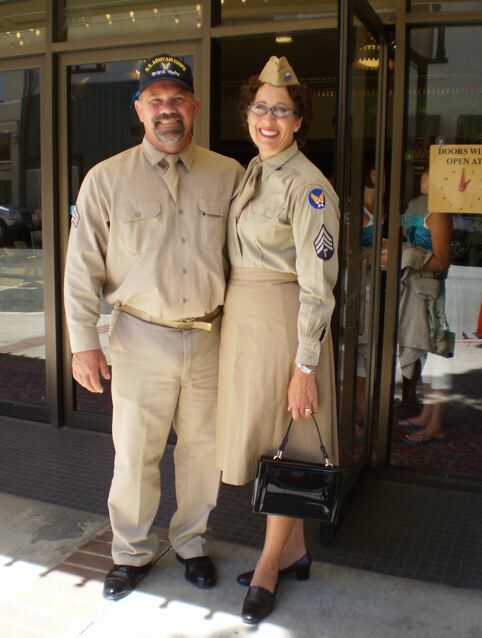 Marci and her husband, John, dressed in the outfits they wear to Moonlight Swing Big Band, a Glenn Miller tribute band. Their attire added to the festive atmosphere. It was great to see Sarah again. I interviewed her on my blog several years ago, met her in person at the Mount Hermon Christian Writers Conference soon after she’d received her first contract, and have gotten to know her better online. Being present for the launch of the final book in her Wings of Glory series was such fun. Each guest received a complimentary ticket to the show, a ticket for the drawing, and free popcorn. We filed into the renovated theater and admired the beautiful architecture as we waited for the show to begin. After the movie and the drawing, Sarah signed more books while I waited to get a photo with her. Someone called my name. I turned and found that the person was none other than Rachel Kent, Sarah’s lovely agent from Books and Such Literary. Rachel and her agency partner, Michelle Ule, had driven over from Santa Rosa to attend Sarah’s book launch. I was mightily impressed by their show of support. Rachel and Michelle are every bit as nice in person as I’ve found them to be online. 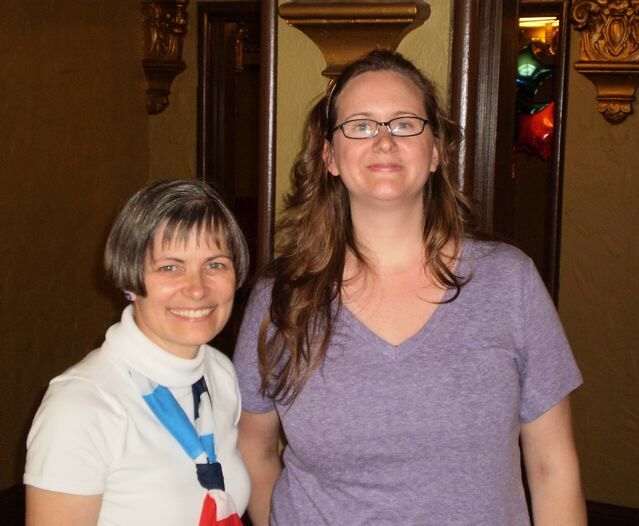 While Sarah was impressed that my husband and I made the two-hour drive to attend her launch party, that was nothing compared to one of her guests who traveled all the way from Boston. Yup! What’s even more amazing is that this guest was Kate Burnett, the social media manager for Christianbook.com. Kate had read Sarah’s books, loved them, and arranged to take a vacation so she could visit California and help celebrate Sarah’s release. Isn’t that one of the greatest author appreciation stories you’ve ever heard? 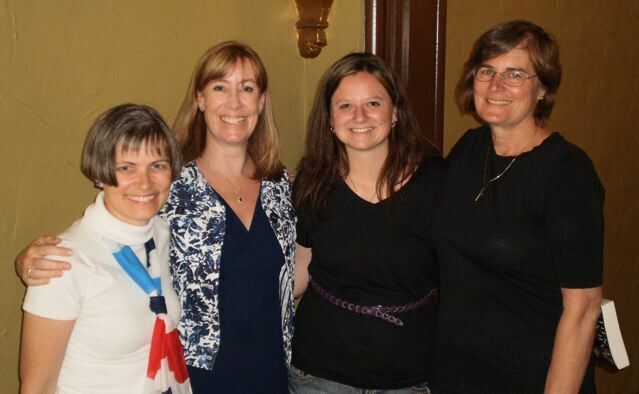 I had a wonderful time at Sarah’s party and enjoyed meeting Rachel, Michelle, and Kate. My husband and I were able to have lunch beforehand with longtime family friends who are Sarah’s friends, too, having served as her aviation advisers on her second book, A Memory Between Us. Don and Nancy McDaniel appear in that book’s acknowledgements. Isn’t it amazing how writing connects so many people? 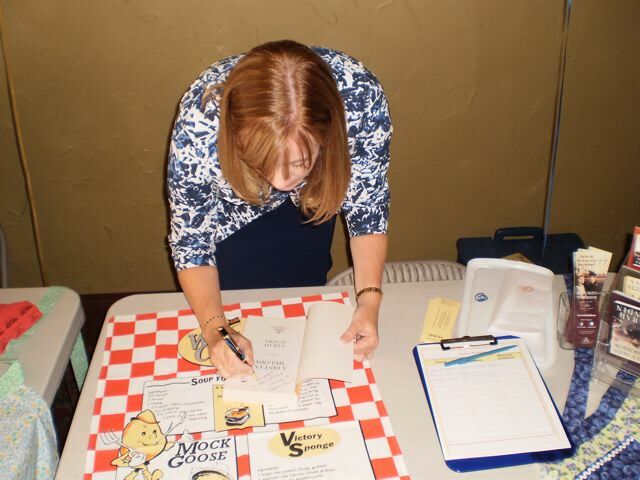 Have you attended a book launch party? If so, what was it like? If you’ve held a book a launch party, what contributed to its success? To enter the drawing, leave a comment by Sept. 1 and include your email address when prompted. I’ll draw the winner’s name Sept. 2 and post it here as well as in the comments. Congratulations to Melissa K. Norris, winner of the drawing! Prizes will be mailed to U.S. or Canadian addresses only. This entry was posted in Fun & Friends, Reading, Writing & Promotion and tagged Blue Skies Tomorrow, Book Launch Party, Book Release Ideas, Kate Burnett, Keli Gwyn, Marci Seither, Michelle Ule, Rachel Kent, Sarah Sundin. Bookmark the permalink. This sounds like so much FUN!! I’ve never attended one but when I do, I sure hope the novelist is as creative as Sarah! It looks like the launch party was fun and a great success! Please enter me in the drawing and thanks for the chance to win. 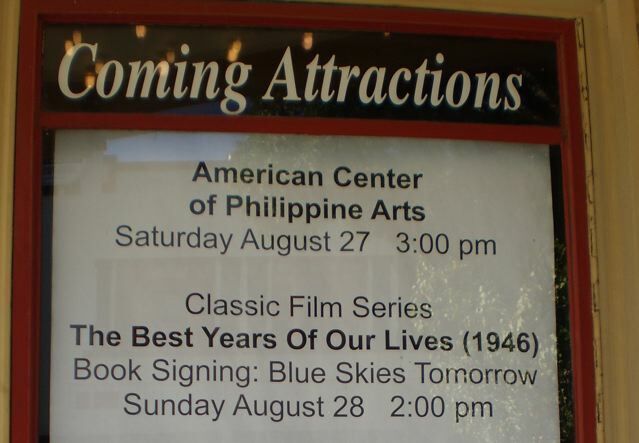 I really enjoyed myself at Sarah’s Launch Party of “Blue Skies Tomorrow” and watch the movie; The Best Years of our Lives (1946). Which I so recall watching as a child in the 50’s ( I am a movie-holic). Being at the signing I would not miss it at all!! Was quite an overcoming feeling to enter the theatre after 54 years. My parents ran the El Campanil back in the 50’s which they introduce famous musically artists from Mexico to the Spanish speaking people throughout several counties. We had up to date movies; also in Spanish. What a joy to sit in the audience and take in all the wonderful great memories of being a kid again. The bonus was to watch my friend Sarah to share the joy of the success that God has given her in the books she has written. Many have not have an opportunity to sit back and listen to our veterns talk about what they experienced as young men at war. Sarah is a gentle spirit and lovely lady. God Blessings on her as she continues this new journey in words. One day soon I also will finish my novel..soon. Thank you for posting this Keli. Thanks to everyone who stopped by to share in my excitement about Sarah’s release and to those who left a comment. Congratulations, Melissa! I’ll be in touch. I wish I could have been there.It looks like you all had a great time. I’m one of Sarah’s critique partners and I’m impressed. Way to go, Sarah!